Interested in the world of electronics, robots, circuits and more!? So are we! 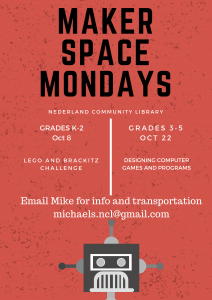 Join us select Mondays for a fun, exploratory hour playing and tinkering with Scratch programming, Sphero robots, Little Bits and other electronics. This hour is designed for elementary-aged creators (sessions for K-2 and 3-5) to expand their curiosity and knowledge of how these amazing technologies work. For more information, e-mail michaels.ncl@gmail.com or call (303)-258-1101. ELS are computers geared for young learners (ages 2-8) that come loaded with 60 educational programs that cover topics like math, science, art, history, reading and more. One of our ELS computers has a touch screen, a mini-mouse, and colorful keyboard designed for little hands so it is easy for kids to use. Our second computer has the same features, but does not have a touch screen. These computers are located in the children’s section. We have two iPads available for in-house use in the children’s section. Both are loaded with educational applications especially for kids. Parents will need to be present for children to check out iPads and they must have a valid ID available. We have one YA Nook available for check-out. This e-reading device comes pre-loaded with many books that are appropriate for older children and teens. 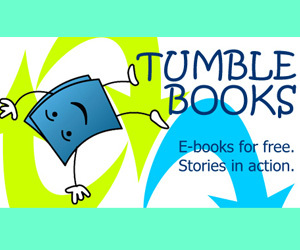 TumbleBooks provides kid-appropriate e-books, videos, language learning, puzzles and games that are available to use without download or checkout. All that you need is your library card to log in to their website. 3M Cloud Library and OverDrive, provide selections of e-books and audiobooks that are appropriate to younger and teen readers. Log in using your library card number and pin to gain access to materials. Please note that these platforms also contain content that is more appropriate for mature and adult readers.